Thu, Sep 13, 2018, 09:08 pm SL Time, ColomboPage News Desk, Sri Lanka. 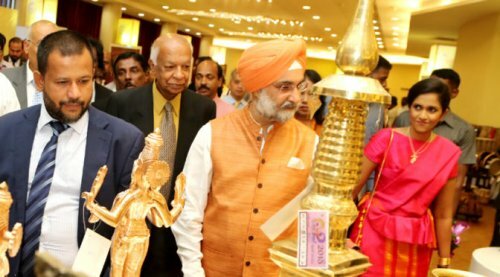 Sept 13, Colombo: Despite India's renowned arts and craft traditions of millennia, Sri Lankan handicrafts are very much popular with Indians, according to the Indian High Commissioner to Colombo Taranjit Singh Sandhu. "Sri Lanka, like India has a tradition of handicrafts. The handicrafts in both our nations continue for millennia. Sri Lankan art creations are very popular with Indians," said the Indian High Commissioner. High Commissioner Sandhu was addressing the launch of Sri Lanka's national Handicrafts Festival 2018 on 12 September at BMICH. He was joined by the Minister of Industry and Commerce Rishad Bathiudeen, Agricultural Minister Mahinda Amaraweera, and Deputy Minister of Industry and Commerce Buddhika Pathirana. Many distinguished craftsmen from Sri Lanka, India, Bangladesh, Nepal, and Malaysia participated in the event organized by the National Crafts Council (NCC). NCC's six-day long Shilpa Abhimani festival showcases 1418 designs of Sri Lankan craftsmen that won awards at Provincial levels and will compete for Presidential Awards later. Speaking further, the Indian High Commissioner noted that cave paintings in Sigiriya, Dambulla, and wood carvings in Lankathilaka Temple, speaks of exceptional skills of master-craftsmen of yester year. "You will agree with me that the wooden masks have become synonymous with Brand Sri Lanka. The history of Indian handicrafts go back to almost 5000 years," said High Commissioner Sandhu. "There are numerous handicrafts from Indus Valley civilization in Indian handicrafts (sector) which have become popular. Each handicraft leaves a legacy. There is a niche market for products such as banana and bamboo fabrics. The market for organic dyes, clothes & fabrics is growing." He added that the people to people relations formed the pillar of India-Sri Lanka partnership. "This partnership is expanding, which symbolizes the connectedness and togetherness. Sri Lankan art creations are very popular with Indians. Every year thousands of Indian tourists take part in wonderful memories and beautiful handcrafts from Sri Lanka. I hear Sri Lankan craftsmen also enthusiastically participate in the annual Surajkund Festival in India. Such interactions not only generate opportunities to exchange ideas, they also provide opportunities to Lankan craftsmen. Shilpa Abhimani is a unique event where an international platform is provided to artisans. I must congratulate the National Crafts Council of Sri Lanka for organizing this event." The Surajkund International Crafts Festival in Faridabad (Haryana State) in India, is the country's largest arts and crafts festival. Addressing the event Minister Bathiudeen stressed of the achievements of NCC. "With the Japan based International Research Centre for Intangible Cultural Heritage in the Asia-Pacific Region (IRCI) the government is now working on a project to revive traditional textiles and women's handicrafts in North and Eastern Provinces. We thank both UNESCO and IRCI for supporting us in this project which is expected to close in 2019. With the EDB the NCC will conduct a special workshop on exporting process for nearly 100 Master Craftsmen. With the Central Environment Authority the NCC plans to conduct a workshop on Waste Management for our craftsmen on the use of environmentally friendly raw-materials. We thank India for supporting our crafts sector," said Minister Bathiudeen. NCC Chairperson Heshani Bogollagama too praised India for supporting Lankan crafts and appreciating Lankan designs. "There are 26000 Sri Lankan craftsmen. Training them and taking their crafts to the market are important activities. We expanded our training centers and now we have a total of 112 centers across the country," she said. According to the Sri Lanka Export Development Board, export of crafts increased last year by 11% to US$ 61 million from 2016's $56 million. The largest craft volumes were toys, ceramic ornaments and copper designs.